There have been hundreds of research papers on relative strength momentum since the seminal work by Jegadeesh and Titman in 1993. Relative momentum has been shown to work in and out-of-sample within and across most asset classes. Theoretical results have been consistent, persistent, and robust. This was followed by my "Absolute Momentum: A Simple Rules-Based Strategy and Universal Trend Following Overlay" in 2013. Results are hypothetical, are NOT an indicator of future results, and do NOT represent returns that any investor actually attained. Since then, there have been other good absolute momentum research papers. But absolute momentum and trend following in general have still not gotten the attention they deserve. Major fund sponsors offer single or multi-factor products using relative momentum. But not a single one incorporates absolute momentum as a trend filter. Absolute momentum can enhance expected returns just like relative momentum. But, unlike relative momentum, absolute momentum can also reduce expected downside risk exposure. It performs best in extreme market environments, making it an excellent portfolio diversifier. Let us look at other trend following research over the past few years. In 2014, Lemperiere et al. applied exponential moving averages to futures since 1960. They examined spot commodities and stock indices since 1800. Their “Two Centuries of Trend Following” showed a t-statistic of 5 on excess returns since 1960 and a t-statistic of 10 on excess returns since 1800. These results were after accounting for the upward drift of the markets. The effect was stable across time and asset classes. There was also no degradation of long-term trend strength in recent years. In "Timing the Market with a Combination of Moving Averages," Glabadanidis (2016) presented ample evidence of the timing ability of a combination of simple moving averages applied to U.S. stocks. A comprehensive treatment of moving averages is in a new book Market Timing with Moving Averages: The Anatomy and Performance of Trading Rules by Valeriy Zakamulin. Zakamulin has already written academic papers on moving average methods. 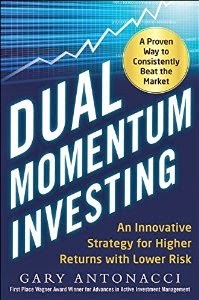 In the book, Zakamulin analyzed eight different types of moving averages along with absolute momentum. He applied these to stocks, stock indices, bonds, currencies, and commodities since 1857. He showed that these strategies can protect portfolios from losses when needed the most. Zakamulin's conclusion was that trend following represents a prudent investment approach for medium and long-term investors. What is especially interesting is Zakamulin’s 159-year test on the S&P Composite Index. He looked at the frequency of positive results using a 10-year rolling performance window. Absolute momentum came in first and second place among the strategies tested. It also held 7 out of the top 10 highest positive rankings. There have been at least a half-dozen noteworthy studies during the past few years that focused on absolute momentum. In Trend Following with Managed Futures, Greyserman and Kaminski (2014) applied absolute momentum to stock indices, bonds, commodities, and currencies all the way back to 1223! They held assets long or short depending on the trend of the last 12 months. The authors found that trend following was more effective than buy-and-hold. Sizes of the five largest drawdowns were also reduced by an average of one-third. In “The Trend is Your Friend: Time-Series Momentum Strategies Across Equity and Commodity Markets,” Georgopoulou and Wang (2016) found that absolute momentum was significant, consistent, and robust across conventional asset classes from 1969 to 2015. In “Trend Following: Equity and Bond Crisis Alpha,” Hamill, Rattray & Van Hemert (2016) applied absolute momentum to global diversified markets from 1960 through 2015. Absolute momentum performed consistently and was particularly strong during the worst equity and bond environments. In “The Enduring Effect of Time Series Momentum on Stock Returns Over Nearly 100 Years,” D’Souza et al. (2016) found significant profits from absolute momentum applied to individual U.S. stocks from 1927 to 2014 and to international stocks from 1975. Unlike relative momentum, absolute momentum did well in both up and down markets. Absolute momentum fully subsumed relative momentum and was not subsumed by any other factor. The combination of relative and absolute momentum (dual momentum) earned a striking 1.88% per month (t-statistic 5.6). In “Two Centuries of Multi-Asset Momentum (Equities, Bonds, Currencies, Commodities, Sectors and Stocks),” Geczy and Samonov (2017) applied relative momentum to country indices, bonds, currencies, commodities, sectors, and U.S. stocks over the past 215 years. But they also showed that absolute momentum (which they called “trend”) had highly significant positive results in every asset class. In “Time-Series and Cross-Sectional Momentum Strategies under Alternative Implementation Strategies,” Bird, Gao, and Yeung (2017) found that both relative and absolute momentum generated positive returns in 24 major stock markets from 1990 through 2012. But absolute momentum was clearly superior. With appropriate cutoffs, absolute momentum outperformed in all 24 markets. The authors concluded that momentum is best implemented using absolute momentum. A recent study of absolute momentum by Hurst, Ooi, and Pedersen (2017) is an extension of their earlier paper, “A Century of Evidence on Trend-Following Investing.” In it, the authors studied the performance of trend-following across global markets (commodities, bond indices, equity indices, currency pairs) since 1880. 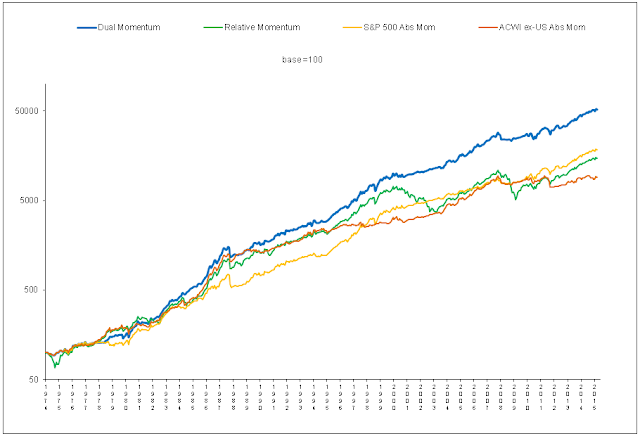 They found in each decade since 1880, absolute momentum delivered positive average returns. This was accomplished with low correlation to traditional asset classes and after adjustments for fees and trading costs. Absolute momentum performed well across different macro environments and in 8 out of 10 of the largest crisis periods. It performed best during extreme up and down markets in U.S. stocks. The non-acceptance of absolute momentum as a trend filter by most fund sponsors in the face of strong evidence of its effectiveness has three likely explanations. The first is that research information disperses very slowly through the investment community. The second is that investors prefer to follow the crowd, even if that means losing more in down markets. They may also be averse to experiencing trend following whipsaws. The third reason is the possible long-standing bias against trend following. This has been difficult to dislodge, despite strong evidence of its effectiveness. These three tendencies are well-known now in behavioral finance as the slow diffusion of information, herding, anchoring, and confirmation bias. Based on research results, trend may be the strongest factor. Yet it is also the most ignored. This is good news for those of us using it. Many academic papers refer to relative momentum as cross-sectional, even though some applications are cross-asset, not cross-sectional. Academic papers often refer to absolute momentum as time series momentum. But all momentum is based on time series. Geczy and Samonov (2017) repeatedly characterize all momentum as time series momentum in their latest paper.